Telling a story about the birth of a nation in two hours proved harder than expected. With budget limitations, insufficient support from relevant parties and historical landmarks that no longer exist, the making of 1957 Hati Malaya has been a long and arduous journey. But now, director Shuhaimi Baba and executive producer Aida Fitri Buyong can smile as the movie is currently in the final stage of editing. The movie is scheduled for release in October. “There were days on the set when there was so much madness that we felt we would not have made it to the end of the shoot,” said Aida during the launch of the website recently. “Many of us felt it was a huge responsibility and frightening experience: how do you tell a story of our founding fathers and the birth of a nation in two hours? footage of actual events with the contemporary scenes. The film’s presentation is unique as the story is narrated by five young urbanites living in present-day Malaysia. These characters – Salmi (Maya Karin), Hali (Rusdi Ramli), Rafik (Adlin Aman Ramlie), Ani (Sharifah Amani) and Ang Lee (Douglas Lim) – are assigned to produce a picture book to commemorate the country’s 50th year of independence. While researching the subject, they find themselves transported back to the colonial era and become involved in the momentous events leading up to Merdeka. 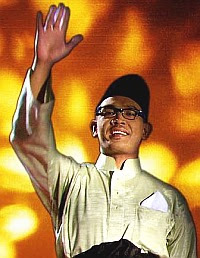 The film focuses on Tunku Abdul Rahman, founder of the Alliance Party (now Barisan Nasional), who became the first Prime Minister in 1957, as well as Datuk Onn Jaafar, who founded Umno (United Malays National Organisation). Onn fought against the formation of the reviled Malayan Union proposed by the British in 1946, which would have allowed the colonial masters to spirit away Malaya’s wealth. Performing arts lecturer Mohamad Kamarulzaman Taib took on the role of Tunku and Onn is played by theatre actor Zaefrul Nordin. The country’s two other founding fathers, Tun Tan Cheng Lock and Tun V.T. Sambanthan, are portrayed by The Star’s associate editor Kee Thuan Chye and actor G. Nadarajan, respectively. The movie soundtrack, which includes two theme songs, Perlu Kamu (composed by Ajai and performed by Ajai and Kris Dayanti) and Hati Malaya (composed by Sharon Paul and performed by Datuk Siti Nurhaliza), will be available in September. “One of the challenges we faced was that during our one year of research, we found out that most of the documents on films and prints pertaining to our independence struggles were largely accounts from the British perspective. “But for this movie, our interpretation is drawn from both British and Malaysian sources, including printed materials, film footages and interviews with historians and personalities closely associated with the independence movement’s key personalities. “I really hope that the younger generation will watch the movie so they will know what great thinkers we had at that time and how people suffered before the country achieved its independence,” said Shuhaimi. The movie’s official website, http://www.1957hatimalaya.com/, is in full operation now. Fans can get details about the movie and the cast and enjoy the interesting interactive activities on the website.